Following the comments by Shawn Crockwell about an “immigration raid” at his home, the Ministry of Home Affairs said they received multiple complaints about a person who was “allegedly working illegally,” so visited four residences on the island — with Mr Crockwell’s residence the fourth residence visited. Speaking about an “immigration raid” on his home during his speech announcing he was resigning from the OBA, Mr Crockwell said: “I’m not going to get into the details of this because there are individuals that I don’t want to expose, including the company that I hired two years ago. “Two years ago I hired this company on the referral of a very prominent family, to clean my house, and they been cleaning my house and doing a fantastic job, Mr. Speaker, for two years. Not one complaint. Stellar job. Comes once a week, four hours. Once a week, had no issue. “The primary cleaner, I know is married to a Bermudian, and has children from a Bermudian. I don’t know everyone that came to my house, but I can tell you that, because of course, during the day I’m at work, but I find out that there was a directive, Mr. Speaker, because of a some suspicion that the company may have had an illegal worker on their staff, there was a directive to apprehend this illegal worker at my house. The statement said, “The Department of Immigration [DOI], in the normal course of its operations, conducts many investigations, one of which was raised as a matter of concern by M.P. Shawn Crockwell in the House of Assembly on July 1st. “The Ministry of Home Affairs can confirm that in this instance, over the course of several weeks, the DOI received multiple complaints from an anonymous complainant about a person who was allegedly working illegally, without a work permit. “As such, the DOI acted in accordance with its normal investigation protocols, one of which is to act on information which is reasonable and where it appears there may be a case to answer. “It was alleged that this individual was undertaking cleaning duties at various residences. “And, since the DOI has, in the past, caught persons on the spot working illegally in Bermuda, Immigration Officers visited four residences the island on different dates and at varying times of the day. M.P. Crockwell’s residence was the fourth residence visited during this investigation. 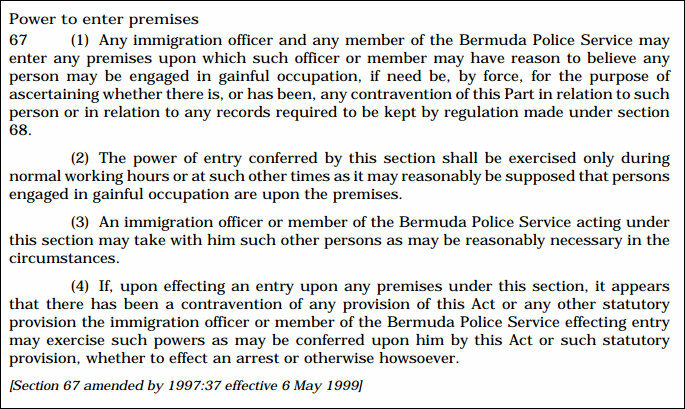 “The powers to enter and search residences are in accordance with the Bermuda Immigration and Protection Act 1956, Section 67. “This reference was shared with M.P. Crockwell during his line of questioning of the Officers. And when Immigration Officers spoke with M.P. Crockwell they also advised him that he was not the subject or focus of the investigation,” the Ministry continued. So why is Minister Crockwell throwing a hissy fit? Does he think he is above the law? Of course he does….what a surprise! I’m sure he doesn’t, but given what has been happening lately I find it very strange that this happened at this point. @ LOLOLOLOLOLOLOL…….of course the timing of this is no coincidence. It’s the UPB doing what they do best. This is the immigration dept…no ministerial interference at all…can’t you read? Former Minister… and hopefully before too long former MP. I feel the same was about Dunkley, Fahey and the rest of umm…. You Bermudians need to wake up. I’m willing to gamble that Crockwell has been told 4 different versions. Now Immigration has only made it worst. Here is something Bermuda voters should consider! Whenever have you seen Immigration give a response on Bernews about any investigation? Oh dear . Does this mean that all the UBP style retribution claims were unfounded ? @ Toodle-oo………not so fast. We right thinking Bermudians know only too well, as I have said a few times here in the past, the name (UBP) has been changed, but the game is the same (OBA). He’s getting de O J Simpson treatment. Like P.L.P. was responsible for de world recession. You should think before you put it in ya mouth. maybe not the world, but CERTAINLY the PLP are entirely responsible for Bermuda’s recession. they say they don’t have a clue where all the “overages” and missing invoices went… imagine all that money could have gone to keeping our SCHOOLS open. fool. The damage has been done. The PR win goes to Mr. Crockwell. Government can deny any vindictive action taken against Shawn, but it’s all about perception. Any damage that was done was purely in the eyes of those hoping and wishing that it was politically motivated and came directly from the OBA government’ . Now that it’s been proven that it didn’t those people who had their hopes and beliefs crushed will no doubt be singing about ‘Crockwell/immigration gate’ for years to come trying to bring to life yet another Frankenstein lie . To name a few… feel free to add, fellow commentors. Dont forget dat bie Penniston. @ Toodle-oo, you have got to be kidding. Proven that is wasn’t politically motivated……..hahahahaha. Where’s the prof? How many times do I have to tell you, NOT SO FAST, gheeeesh! Please let me know the time and day that you plan to show up at the Immigration Dept to call them all liars and I’ll be there to shake your hand. Shawn, if you know something, now is the time that you expose all! Your character and integrity is at stake! This could possibly affect your political future and practice! This is something that cant be swept under the rug. I’m sure you know by now youre being thrown under the bus! M – I agree with you. It appears that the ‘anonymous complainant’ timed their tip off very well. Now who do we know that is very good at PR and wants to show the Government in a bad light? Magic bullet anyone? So i can just call and give a tip..whether true or not and police and or immigration just goes there and searches lol?any surveillance…investigation…warrants?…or on this island do we not have the right to liberty,privacy and due process….third world backwards cesspit.. Unfortunately, you are correct. The Department of Immigration only needs to satisfy itself that a matter is reasonable for further action. I believe the Department when they say there was no ministerial interference and that they were operating within normal protocols – which is basically to treat anyone complained about as an ‘illegal’ until proven otherwise. There’s even an unfortunate section of BIPA that says the Department doesn’t need to give reasons for their decisions. In a sense, the furor over Crockwell’s comments is masking a more fundamental point here which is the way the Department polices work permit policies in Bermuda. I think the first thing we need to figure out is, was this a ‘Raid’ or a ‘ Visit’ cause the two mean very different things. What your talking about Sad would be what is need for a ‘Raid’ and yes you should need all those things in order to do a raid. But if it is a ‘Visit’ well then you don’t need all those things and it should be all that agressive. Since when do visits include searching people’s houses? Sorry where was that in the article, I must have missed that bit. When have you heard of the Authorities “visiting” anyone? Whats the purpose of that? I guess to warn them the next time they come they will be looking for an alleged illegal worker!! I’m just saying it as I see it, it is also possible that they were there at the person’s home hoping to catch the person in the act of illegaly working. What about others working in two different positions, is immigration going after them? Yes. If you know something say something. There is a hotline where you can call in. Did they find the person? So, they want people to think one has nothing to do with the other? If one believes that than one should also believe Bermuda is in Europe. Crockwell just get on with disappearing off the scene and stop complaining. you want some cheese with your wine? M.C that cheese and whine saying you always use is cheesy! no pun intended! Investigation….really? lol what a joke. your press release is a very thin attempt at damage control. shame on you senior officers for allowing yourselves to be used. no different than the Larry Dennis arrest and Dr. Reddy arrest. pure political interference…and you want to smile and shake my hand? Here’s my query, why are you searching the houses where the person works? If they has a tip about a worker at a constuction company do they search the cement mixer? I don’t get why they searched where the person would have worked? They expect the person to be hiding in someone else’s house? Why didn’t they inspect the business that does the hiring and then look for the person at their residence? Why isn’t this common sense? Because they wanted to search a standing MP’s house without a warrant. Stand Strong Crockwell! I had the exact same questions! If the illegal worker is a cleaner, I’m pretty sure she cleans more than one residence. Why wouldn’t the employer office be the first place to go? As an employer, they should want to protect their reputation to clients…..I can’t tell. OMG! Another ignorant question? You almost answered it yourself! They searched four residences where the person was seen to be working. How the heck do you think they’d find this person in the office? Wow! Because they need to find the person at work to substantiate the reported “working”!! These were immigration officers, they do not need a warrant for immigration offenses…. Are these the THEY you are referring to? Are you serious? You don’t get why the DOI would search the job site – in this case, four residences – where the person was seen to be working? How else would you expect them to catch someone “red handed”? Good grief, it’s not that hard to understand. For your information, the The DOI have caught MANY an illegal worker on construction sites, private residences, restaurants, etc. Also, they do NOT need a search warrant to look for an illegal worker! I suggest doing your homework before making such asinine comments! What’s scary is, 43 people “liked” your comment! SMH! Then arrest her yourself. You have this authority as a constitutional right. Name and shame i say. You sound like a idiot! Take it to the press if nothing has been done after you’ve reported it on a few occasions. Are you afraid of something? @ truth, Crockwell, I doubt you will, but don’t you go anywhere. We need more if you to stand firm against the Milkman and his UPB colleagues. You’re probably one of those PLP supporters who had nothing but nasty things to say about Shawn, but now, you all of a sudden love him! Cracks me right up! And this is what it all boils down to . Had I been someone who had a cleaner at my house who was being investigated by the immigration Dept I’d consider it a tad inconvenient that the department had to come to my house to check that the person in question was working for the company , but it should have been the company that takes the licks. I’d heave a sigh of relief that I wasn’t employing the person directly . If I was Crockwell I would have simply said ‘hmm , how interesting’ and left it alone . Silence . It was nothing to do with him , or was he being targeted either . He made the mistake of trying to play the ‘poor me , I’ve been victimized ‘ card at just the right time and to everyone with a brain ( that doesn’t include all the ‘dislike brigade’ here on the subject) he looks very foolish . But you all love a conspiracy theory . Ok, so if what you^^^^ suggest is true, who knew the so-called illegal worker would be at Crockwell’s house at the time of the search? Mr. Crockwell hired the company not the individual. Something doesn’t smell right to me…ijs Timing is suspect! They searched four homes…not just Crockwell’s! It took awhile but nice of the DOI to come forward & take responsibility for doing their job. It involved Mr Crockwell’s house. Nothing more. Of course that is not going to fly with the gate this & gate that crowd. Pickings are slim for anything to make the OBA look anything near their beloved PLP but you have to work with what little you get. Listen up Bermuda. If you know of an illigal immigrant photograph them , detain them where they are with the express notification that you are calling the police. Enough is enough with the blatant abuse of immugration and work permit policy. So Mr.Crockwell says that it was after the raid that the relationship between he and the leadership of the UBP/BDA/OBA/UBP became ‘unworkable’ and he decided to resign from the party and become a Independent MP . My question is this , WAS HE PUSHED , OR DID HE JUMP ? Whose fleas are biting him ? Doesn’t the Dept. Of Immigration have a mug shot of EVERY work permit holder on island ? If not , why not ? Think Col. Burch ! Raiding the mans castle was intrusive , uncalled for and intimidating . That’s why a official dossier of the suspected offender should have been presented to the homeowner , office manager , grocery store manager , whom ever hires that cleaning company , for identification . This whole episode is straight out of the UBP/BDA/OBA/UBP strategic effed up play book ! If it wasn’t so serious , it would be childish behavior ! GOOD GRIEF! THEY HAVE TO CATCH THE PERSON WORKING RED HANDED! What the heck does Col. Burch have to do with it? Where are all your negative words about Crockwell now?? Your sickening,stupid,childish,uninformed words are as always, TYPICAL of you coffee! Polly want a cracker??? I know someone else who was involved in a scenario like this (perhaps the same case) they politely answered questions and gave a statement and never felt that they were subjected to anything out of the ordinary. I think Shawn knows that there was no malice intended and dragging down our good people at DOI is politics at the shallow end. Good riddance. Yeah right Wahoo!! People would make up anything…bottom line is,you have sour grapes about Shawn leaving your Party, not before exposing the UBP/OBA! Please remove the BRAIN part from your name! I just did….What does iac mean ? LOOKS LIKE YOUR BRAIN HAS ALREADY BEEN REMOVED FROM YOUR HEAD!! @Awake ,YOU MUST BE STILL ASLEEP !!! Did you just spend 15 minutes removing brain from brainiac? Haha you are a maniac! HUH? I didn’t realise you are 12 yrs old. Someone in Immigration had it in for Crockwell. The Real Bermuda wont be fooled by cover-ups. You can say what you want its clear as day mate. Why oh why don’t you read the article. Thinks he is above the law! He was when he was with the OBA/UBP…..remember Jetgate?? BTW YOU BETTER BE VERY CAREFUL…..PEOPLE STILL WANT ANSWERS TO JETGATE….SHAWN JUST MIGHT HAVE THEM!!! I think Shawn Rockwell’s annoyance with the OBA is real but I also believe he got played by whoever made the anonymous call into Immigration. They knew he was really angry at the party and willing to step down and then called into immigration because they wanted to thin the numbers in the House. The current law appears to violate the constitution. No one seems to be bothered by the overreaching law. Now if Mr Crocwell were to sue how would he face or be able to cross examine the “accusers” if the parties involved are anonymous. What’s so disturbing to me, is that everyone is complaining about childish political points instead of being upset at the real violation against their rights. Another event to undermine my trust of the current government construct. Part time minsters – full time follies.